Caprese Grilled Cheese Sandwich. For National Grilled Cheese Sandwich month. Did you know that April is National Grilled Cheese Sandwich month? Once upon a time, while preparing this sandwich, a dear friend of mine told me that she didn’t like caprese salads… I went numb. I almost fell off my chair. I think I had a slight heart attack. Who doesn’t like a Caprese Salad? I can understand hating watermelon, or honeydew, but a salad with tomatoes, and cheese, and basil?! That’s just bananas. While everyone else was attacking a deep dish pizza, I was in my little kitchen preparing this with my new panini maker. 23 million (exaggeration) sandwiches later, I can confidently share a few tips for the perfect Caprese Grilled Cheese Sandwich. 2. Grape tomatoes or cocktail tomatoes work best. 3. Skip the vinaigrette, and only use olive oil with a sprinkle of salt and freshly ground peppercorns. 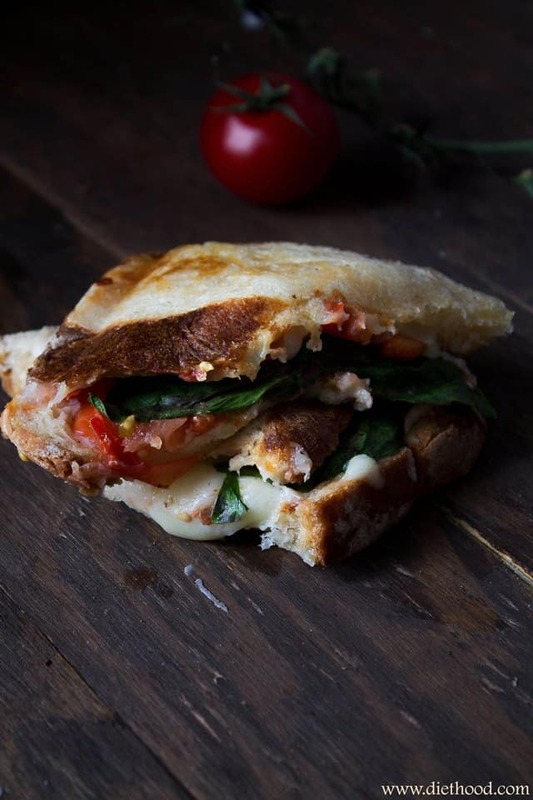 Sliced tomatoes, mozzarella, and basil leaves offer the perfect combination for a flavorful and delicious grilled cheese sandwich. Generously butter both slices of bread, on both sides. Place a slice of mozzarella cheese on bread. Add half of the sliced tomatoes on top of the cheese. Add another slice of mozzarella cheese, and top with bread. Allow it to grill for about 1 minute, or until lightly browned and cheese is melted. Need more Grilled Cheese ideas? Thank you SO MUCH for the kind words!! They mean the world to me!! God Bless! what an incredible sandwish you created! I love it,especially the yucky tomatoes!! I had featured U in the text of “Top 7 Convenient and Simple Sandwiches for Picnic” on all freshrecipes,I will pay close attention to your updating. u’re WELCOME! expecting ur renewing recipes. This grilled cheese looks out of this world. What a perfect way to celebrate National Grilled Cheese Sandwich Month. 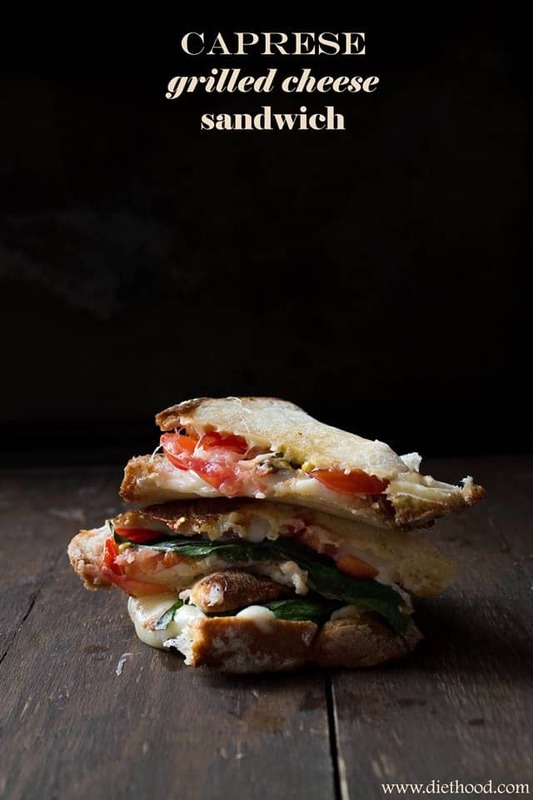 We love that you’ve perfected this caprese sandwich over the years. For a fun twist, we recommend trying a mozzarella cheese blend, like the Sargento Natural Blends Deli Style Sliced Provolone-Mozzarella Cheese. It’s a great way to shake up a great sandwich. This sandwich was amazing! I ended up adding a few more tomatoes and it turned out great. I shared it in a recent meal plan on my blog and look forward to trying more of your recipes in the future, thanks! Yay! I’m SO glad you enjoyed it!! 🙂 THANK YOU! 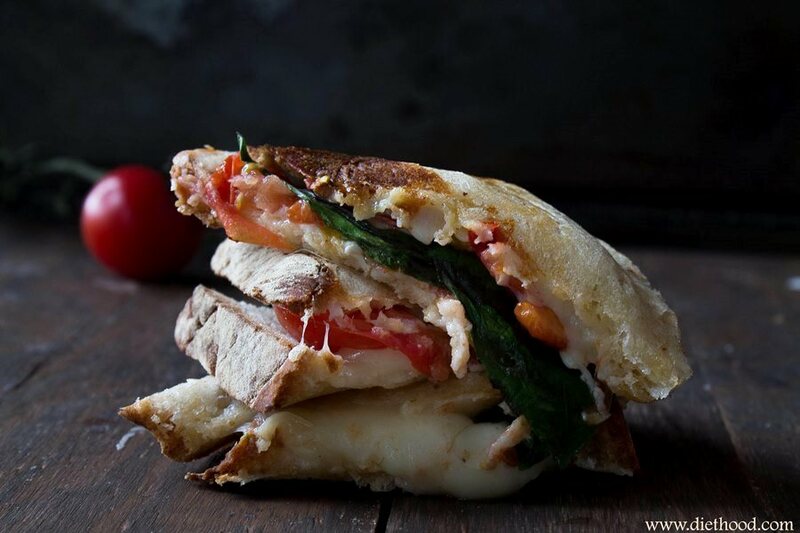 I anything Caprese–this sandwich is gorgeous! Oh yummy! What a great sandwich to come out of a craving from a hangover. I have a few of those myself. 🙂 This is a keeper! Oh I LOOOOVE the mood in this sandwich. I tend to make my picture very bright, but I actually like dark lighting like this. Such a beautiful sandwich shot, Kate! I’m going to need an extra napkin. Swoon. Ah now you have me craving this!!! Jealous! The most simple ingredients make amazing food. Especially if the flavors are italian. We eat a lot of caprese hand pies here. Love this sandwich! Caprese in any form is my favorite! This is super similar to the Caprese sandwich at my favorite grocery store, and I have NO idea why I’ve never considered making it at home. This looks too good, trying ASAP! Love caprese in any form of shapes! My favorite grilled cheese ever!! Love that you turned the Caprese into a sandwich. Oh, yes, the long islands. Those were my drink of choice in college too. I just wish I would have thought of this sandwich then too! This is heaven for me. Love it! 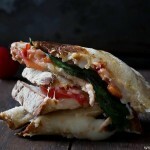 I love the idea of a caprese sandwich, this looks SO delicious! Yummy sandwich barring those yucky tomatoes. You reminded me that I have to go downstairs and wash/dry the plates of my panini press/grill/waffle maker so that I can grill 4 hot Italian sausages. Saves having to dig out my cast iron fry pan or turn on my oven.I really need some good bread though … hot dog buns are a bit disappointing when comparing them to your italian bread. I love grilled cheese! Thanks for the link love! oh my goodness! looks so delicious!!! loooove it. I can’t wait for my basil plants to be tall and obnoxiously oversized again so I can make EVERYTHING with them. This sandwich included! How can someone not like caprese??? I wish I could make this now, but I can’t find any basil. The nursery’s don’t have it yet and the grocery stores have every kind of herb but basil. However, as soon as it’s available. I’ll have my grill pan out! When we go to Italy we try to make a late night trip over to this birreria (brewery). They make all kinds of sandwichs and such. This sandwich looks like it could of come from there. It looks amazing and inviting! I need to pull out the panini press! This sandwich looks too yummy – I kind of want to eat my screen!! what a great way to enjoy a grilled cheese sandwich Kate, such a delicious blend of ingredients! and thank you so much for the shout out! OMG! Kate, this sandwich is incredible! My favorite salad in a grilled sandwich! My mouth is watering! You’re killin’ me posting gorgeous tomato recipes! It will be MONTHS still before I will see a flavorful tomato in my house! I’m getting quite a collection of recipe ideas for when I am inundated with CSA farm share tomatoes–thank you! I know grape tomatoes, plum tomatoes, Sun Gold tomatoes, Black Russian tomatoes, yellow taxi tomatoes, Indian Rose tomatoes. What’s a cocktail tomato, anyway? The pics of this are so good! I love how you turned a salaf into a sandwich. I’ll take a great sandwich like this over a salad any day. OMG! How can anyone not like Caprese Salad. It is like my all time favourite. Hello!! !One of my sister-in-laws is Italian and makes it mostly during the summer when the tomatoes are perfectly ripe and deep red….full of flavour.